We have seen a spike of interest in the Balanced Scorecard since our December 2012 strategy question of the month focused on what kinds of measures law firms are using. As regular readers will recall, the only measures firms are using with a high degree of consistency and reliability are financial measures. Other areas – client satisfaction/client relationships; people/professional development; operational improvement – are generally not measured. 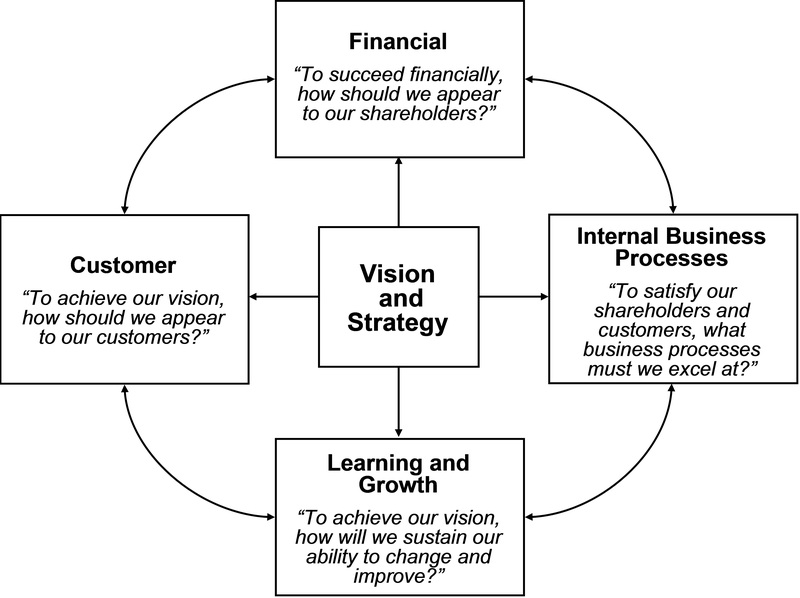 The balanced scorecard, as originally described by Kaplan and Norton, envisions a balanced set of goals, objectives and measures in four areas (as depicted in the graphic below). Those goals and metrics should ideally be focused on advancing the achievement of the firm’s vision and strategy. While these four categories are logical and work for the majority of organizations, the authors (and experienced managers) recognize that measures should be aligned with the strategy (rather than aligning strategy with the generic scorecard categories). The concept is easy enough to understand, but how does one go about implementing some version of the balanced scorecard in a law firm environment? In our 2009 book on the topic, we highlighted the range of barriers law firm managers might encounter when trying to use this very powerful tool to facilitate strategy implementation. We will leave those challenges for another post so we can focus on how to use the balanced scorecard in a law firm setting. 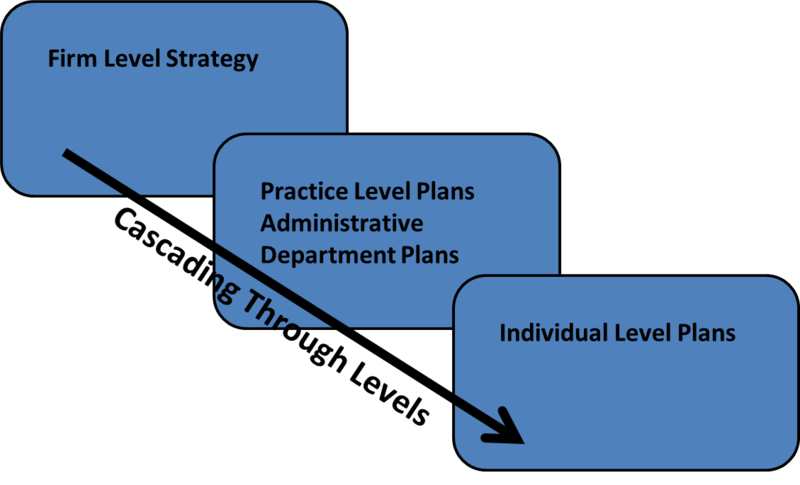 The real key to the process (and this is equally true in a corporate setting and/or a non-profit organization) is to ensure the strategy is aligned from the firm level to the practice (and administrative department) level – and from the practice level to the roles individuals play in strategy implementation. Obviously, this graphic assumes the firm has a strategic plan. For those who might have missed it, our June 2012 strategy question of the month focused on best practices in law firm strategic planning. Some examples of how this cascading works across the categories of a generic balanced scorecard follow. A firm with clear objectives for profit improvement (could be margins, could be PPP, could be some other reasonable proxy) might ask each practice group to identify the profit driver that offers the most promise for improving performance in their area. In this example, the practice has identified realization improvements as the most promising area. They would then set a target for improved realizations and adopt initiatives to drive that improvement. Individuals in the practice would then move those initiatives forward. In this example, individuals would focus on getting invoices out on a timely basis, with higher levels of accuracy. Thus, the firm’s goal for improved profit margins cascades to a practice’s goal for improved realizations, which in turn cascades to individual’s committing to more timely billing. Our second example focuses on the client dimension of the balanced scorecard. At the firm level a goal might be adopted to broaden client relationships where ever possible. This might be translated into an objective measure that tracks how many clients are served by multiple practice areas and/or partners from different practice areas. At the practice level, this focus might translate into a set of target clients for whom the practice wants to expand its relationships (either bringing other practices into their relationships or by beginning to serve clients originated by other practice groups). At the individual level, that could lead to specific plans to introduce colleagues to selected clients (or conversely to seek introductions to colleagues’ clients). Our third example focuses on cascading for people oriented goals and objectives. A firm level goal focused qualitatively on having the best people in the market could be measured via the number and nature of external recognition(s) the firm’s people get (e.g., Chambers, Best Lawyers, Super Lawyers, etc.). At the practice level, that could translate into initiatives and measures focused on getting people professional (or industry) certifications. In turn, individuals can adopt specific plans to build certification into their professional development plans. Our final example focuses on how operational improvement goals might cascade in a law firm. In this case, imagine a firm that has adopted a goal to reduce costs related to delivering client services. A litigation practice in that firm might adopt an initiative to engage project managers on some or all of their matters. At the individual level, partners/engagement leaders would commit to actively partnering with those same project managers to capture the benefits of project management discipline on matters. These are obviously generic examples. However, if you have clearly defined firm level goals, those can (and should) be translated into measurable objectives so progress can be tracked and the firm can make adjustments if the strategy is not working. With clear firm level goals and objectives, practice groups and administrative departments can align their plans with key goals. Note, not every department and practice needs to align with every firm level goal – but, every practice has some valuable role to play in the implementation of the firm’s overall strategy. Finally, this cascading approach enables every individual to take meaningful action that contributes to the achievement of practice and firm level goals.